I am working in affiliation with the incorporated organization, Save Our Swans, USA. (website under construction). Please contact Kathryn Burton, president, at SaveOurSwansOrg@aol.com for more information. To everyone who cares about animals and the environment: I am trying to start a grass-roots letter campaign to save swans. Specifically, the swan with the "S-curve" neck that is on the Valentine's Day card you give your sweetheart, the swan whose beauty and grace inspired Tchaikovsky to write his famous ballet, "Swan Lake." This particular species is called the Mute Swan, and it is being targeted for total extinction in a very cruel way, by the hunting lobby and the politicians that cater to that lobby. Because most people are fond of this bird, the plans are being made under the radar and are being pushed through secretly and quietly in what are called "silent takings." Very few people are aware that this is happening. Animal and environmental organizations are not really doing much about it at this point. However, I am joining with some people who are working on several lawsuits to help prevent this secret slaughter from happening, so I know what is actually going on. The short story is that long-standing major legislation giving federal protection to all migratory birds - the Migratory Bird Treaty Act (MBTA) of 1918 - was recently gutted by a disastrous amendment sneakily attached to the Federal Budget, without a vote from the Congress or the Senate, and no one even knew it was there. It was unknowingly signed into law. The primary purpose of this legislation was to get rid of federal protection, thereby paving the way to allow for the mass killing (not hunting, KILLING - "silent takings") of the mute swan, with the ultimate goal of replacing this swan's territory with another species, the trumpeter swan, which is the latest trophy animal for hunters. This will be accomplished by allowing 80% of the mute swans to be DESTROYED, with the remainder neutered and surgically amputated by a procedure called "pinioning" (removal of the lower wing so that they can't fly). This will be a one-generation extinction in this country. A "smear campaign" is now underway, painting the mute swan as an aggressive and destructive animal that MUST be gotten rid of, to make the unaware public more accepting of killing and ultimately hunting them. I have written a more detailed history below, for those of you who want to know more about this. It is important to know that none of the information being disseminated about the swans is based on scientific fact, as has been shown in two federal court cases which threw out the cases against the swans and demanded real scientific studies. Indeed, the environmental impact study was called "junk science" by the federal court. We have to reach people who can influence the Congress and reverse the MBTA changes. It would be of tremendous help if you would send an e-mail to your senator and congresspeople and the President and Mrs. Bush, and forward this e-mail to everyone on your e-mailing lists asking them to do the same. I am even providing basic form letters for you to use (below), to make this as easy as possible. In return, you will help to save a beautiful animal from a coldly-calculated extermination and extinction in the United States. Your senators and congresspeople did not have the opportunity to vote on this amendment to the MBTA. Because it was attached to another piece of legislation, it was only voted on by a committee. However, now that federal protection for the birds has been removed, it is back in the hands of individual states to devise their own laws about the swans. This is why it is critical for your representatives to hear from you and to get the word out to as many people as possible. It is VERY easy to find your senators, congresspeople and other congressional info - simply go to congress.org and type in your zip code. Once you see who your legislators are, you can send an e-mail directly to them from that page or by linking to their home sites. If you want to use the sample letter I have written for you below, simply highlight and copy it into the space for your message (make sure to "copy" and not "paste," as copying will save the original so you can re-use it). I would suggest that you make some small changes or add your own opinions to personalize the letter, but it is more important that you get the letters out even without any change. Please remember that if the only group the government hears from is the pro-hunting establishment, the swan is doomed. Believe me, the hunting lobby is going to great pains to keep this information from the general public. I'm here to see that they do not succeed. Below are sample letters to send to your government representatives and the President and Mrs. Bush. Further down is more background on this issue, if you would like the full story. And please e-mail me if you have further questions or would like more information. Please forward this e-mail to EVERYONE you know (suggestion: if your e-mailing list is more than 30 people, split it into multiple mailings - some Internet providers have problems forwarding large e-mail lists, esp. AOL). Most of all, thank you for helping. Dear Senator ______ (or Representative ______), I am writing to you to voice my objection to the Migratory Bird Treaty Reform Act, which was underhandedly snuck past Congress attached to the Omnibus Budget and signed into law unknowingly last December. This "reform" undermines nine decades of intelligent and responsible management of migrating bird species that pass though the United States, most of them requiring global cooperation and protection for survival. The swan is among the casualties of this disastrous legislation and plans to kill almost 80% of them are underway by individual states. I also strongly protest the plan to kill mute swans, as a result of the removal of their federal protection through this reform legislation. There has been no environmental impact study performed and no accurate scientific data or information whatsoever on the swans and their environment to warrant such extreme measures. Furthermore, if the swans have any negative environmental impact, which has yet to be proved, there are non-lethal control methods readily available. I call on you as my representative to oppose the swan killing and the establishment of a swan-hunting season and to restore the Migratory Bird Treaty Act to its original state. I am writing to you to voice my objection to the Migratory Bird Treaty Reform Act. This bill was underhandedly snuck past Congress buried in the 2005 Omnibus Budget, and you unknowingly signed it into law last December. Originally, you had made the statement that you would never sign such an amendment into law. This "reform" undermines nine decades of intelligent and responsible management of migrating bird species that pass though the United States, most of them requiring global cooperation and protection for survival. The swan is among the casualties of this disastrous legislation and plans to kill 80% of them are underway by individual states. I also strongly protest the plan to kill mute swans, as a result of the removal of their federal protection through this reform legislation. There has been no NEPA study performed and no accurate scientific data or information whatsoever on the swans and their environment to warrant such extreme measures. Furthermore, if the swans have any negative environmental impact, which has yet to be proved, there are non-lethal control methods readily available. I ask you as my president to take whatever measures available to you as Commander in Chief to restore the Migratory Bird Treaty Act to its original state and to oppose swan killing and the establishment of a swan-hunting season. Legislation should not be secretly submitted in order to fool our leaders into authorizing and subverting law that already addresses the issue. I am writing to you to ask for your help and influence as First Lady in saving the mute swan. The Migratory Bird Treaty Reform Act was an amendment that was underhandedly snuck past Congress buried in the 2005 Omnibus Budget, and the President unknowingly signed it into law last December. (The President had stated that he would not sign such an amendment into law.) This "reform" undermines nine decades of intelligent and responsible management of migrating bird species that pass though the United States, most of them requiring global cooperation and protection for survival. The swan is among the casualties of this disastrous legislation and plans to kill almost 80% of them are underway by individual states. You had made a comment at a meeting with Congressman Simmons in Connecticut that you loved mute swans and did not understand why anyone would want to kill them. I am also against the plan to kill mute swans, as a result of the removal of their federal protection through this reform legislation. There has been no NEPA study performed and no accurate scientific data or information whatsoever on the swans and their environment to warrant such extreme measures. Furthermore, if the swans have any negative environmental impact, which has yet to be proved, there are non-lethal control methods readily available. Please take whatever measures available to you as First Lady to help with this issue. A Little History Since 1916, the U.S. has signed four international treaties - with Canada, Mexico, Russia, and Japan - to protect migratory birds which move between countries. Congress enacted the Migratory Bird Treaty Act (MBTA) in 1918, a major aspect of our conservation law, to implement and enforce the provisions of these international treaties. This bill gave federal protection to migratory birds that passed through the United States. Nowhere in the four migratory bird treaties has there been any distinction between "native" and "non-native" species. To the contrary, these treaties are specifically intended to protect birds which move between countries. The new "reform" legislation undermines the very purpose of the migratory bird treaties - to protect birds not just in "native" countries, but across the full range of their ancient migratory routes. The MBTA, which has worked well for nine decades, already includes provisions for dealing with birds which may harm agriculture or the environment. But because federal and state wildlife officials couldn't prove mute swans were causing any damage, pro-hunting politicians found a clever way around the MBTA: they rewrote the law. Late last year, the Migratory Bird Treaty Reform Act was quietly slipped into a 2005 omnibus spending package, buried in 3,600 pages of language. No one saw it. It received no public hearing, no public discussion, and no public debate. It was backroom political dealing at its worst, and a congressional committee passed it. The president signed it into law in December 2004. This secret rider, the Migratory Bird Treaty Reform Act, introduced by U.S. Representative Wayne Gilchrest (R-MD) and U.S. Senator George Voinovich (R-OH) removes federal protections for mute swans and dozens of other bird species. The criteria for removing protections will now be based on a bird's ancestry, and any species declared to be "non-native" to the United States would no longer be safe. The mute swan is a large, all-white bird, recognized by its orange bill with black at its base, common in Europe and Asia without any problems for thousands of years. The birds grace many lakes and bays in the United States, primarily on the east coast. Nobody knows exactly when or how the swans first came to America; however, S. Dillon Ripley, who headed the Smithsonian and the Birding Department at Yale University, has stated they have been here since Colonial days. Some people are working on proving that they may have migrated with other swan species from the Russia/Siberia coast across the Bering Straights, just as man did, and at the same time. There are 9500 year-old fossils of mute swans found in Oregon and older ones found in Arizona and Idaho. If this can be proved, it might help win back the birds' federal protection. Mute swans can still be found in Russia/Siberia/Kamchatka, a short swan flight from Alaska. The beautiful birds stand squarely in the center of controversy, as state and federal wildlife officials and some environmental organizations have been eager to blame mute swans for being aggressive, pushing out other waterfowl, and even destroying submerged aquatic vegetation (SAV) in sensitive areas such as the Chesapeake Bay. They never mention that the SAVs had a worldwide die off in the 1930s, including our east coast, and the enormous pollution that flows into the very shallow Chesapeake Bay every single day from chicken and pig farms, paper companies and unstoppable development on the shorelines has played a major role in the reason why those grasses are only now returning. In the northeast, the grasses had returned by the 1970s everywhere but in Maryland, even though at the time the largest concentration of mute swans was in Long Island Sound, which had already recovered. (Maryland has a particular hunting agenda for the swans and is therefore the most vociferous about their destruction.) The evidence against the swans is flimsy and completely unscientific. Swans can be aggressive during nesting season, but so are many other animals and birds - this is natural behavior. 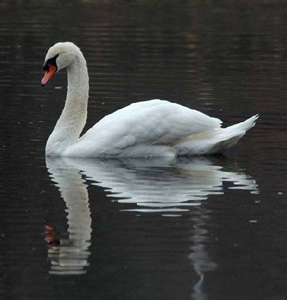 Wildlife agencies' own studies indicate that the small population of mute swans - only 3,600 in Maryland and 14,000 in the entire Atlantic Flyway (17 Atlantic coastal states the birds fly through in their migration) of the United States and Canada - is not causing any real damage. According to the Chesapeake Bay Foundation, the two leading threats to the bay's crucial underwater grasses are agricultural waste run-off from industrial chicken processing plants (nitrogen) and sewage treatment plants. Mute swans probably wouldn't make a list of the top fifty threats. But the big industrial chicken producers pull out all the lobbying stops to defeat any meaningful attempts to control agricultural waste. And no one wants to appropriate the money to upgrade sewage treatment capacity. It's much easier for public officials to scapegoat the swans than to grapple with complex environmental problems. Even in Maryland, where the controversy has been most heated, the state's Department of Natural Resources (DNR) has repeatedly explained that mute swans have only a "negligible" impact on the Chesapeake Bay, that "there is no evidence to suggest that mute swans are causing any impact to agriculture in Maryland," that the birds "are not the primary cause of the decline of SAV in the Chesapeake Bay," and that, in fact, the "decline of SAV has been attributed primarily to elevated levels of nutrients and suspended sediments." Point in fact: the Chesapeake Bay has never met the minimum requirements for the Clean Water Act. In an ironic footnote to the mute swan saga, the federal and state partnership Chesapeake Bay Program recently released a report revealing the startling news that the upper bay's underwater grasses have more than doubled from 2003 to 2004. which if anything, proves that the swans have a beneficial impact and not a negative one. However, they are certainly not promoting this information, preferring to vilify the swans to accomplish their own ends. Origin of the Species? The "Reform Act" targets not only mute swans, but more than 100 bird species-including certain species of storks, pelicans, cardinals, cranes, and orioles-which, according to the new law are not "entirely the result of natural biological or ecological conditions." But who decides which species meet that arbitrary definition? That responsibility rests solely with the U.S. Fish and Wildlife Service. And how do those USFWS decision-makers deal with murky circumstances such as, say, a species that migrates from its native habitat because of environmental changes? Are those birds now considered non-native in their new habitat? They have already admitted that the mute swans migrate through the Great Lakes area into the United States. Isn't that the exact definition of what the new bill stated? Although the swans were the intended immediate target of the "Reform" act, other birds will suffer as well. Some of the species targeted to lose their protection are even considered imperiled under other international agreements such as the Convention on International Trade in Endangered Species of Wild Fauna and Flora (CITES). Species such as the Nicobar pigeon and the Luzon bleeding-heart need global cooperation to survive. Bird species protected in other range states under their domestic laws could be killed when traveling through the United States, undermining diligent efforts abroad to protect these same species at other times of the year. Sadly, so-called environmental organizations that should have been on the swan' side helped the hunters undermine it. Environmental groups such as the American Bird Conservancy, National Audubon Society, Sierra Club, The Nature Conservancy, and World Wildlife Fund should have rallied to the birds' defense, but they are little more today than thinly-veiled hunting groups themselves (The Audubon Society is having a huge internal battle over just this fundamental philosophical difference.). So they joined the NRA, Safari Club International, U.S. Sportsmen's Alliance, and Archery Trade Association in the effort to allow the wholesale slaughter of mute swans. This is disastrous environmental mismanagement, an outrageous political travesty, and abominable and needless potential destruction of one of the most beautiful animals on this planet, solely to fit the goals of a diminishing but well-financed hunting lobby and the federal and state agencies that rely on the sales of hunting licenses to exist.